Kenyaâ€™s airport VIP drama is part of a wider plot aimed at branding Raila an International Security threat, it can be revealed. Uhuru and Ruto have a low self esteem and thanks to ICC, they are losing confidence in themselves. 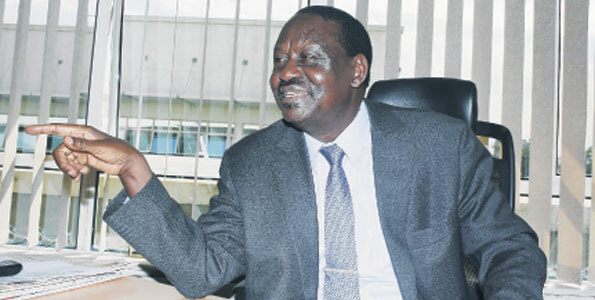 Going through the leaked documents detailing the orders to block Raila from the VVIP lounge, itâ€™s evident that the Raila VIP drama was prompted by Rutoâ€™s well known paranoid delusions, which have been previously serialized by Rashid Wanjala, the Kenyan-Canadian legal analyst Â during the pre-election season. It appears that Ruto, a Kalenjin tribal leader turned Deputy President in a Kikuyu led Kikuyu/Kalenjin tribal coalition carried over his paranoia to the government. Analysts believe that â€œRuto is being used to undermine Odinga, but a way will in due course be found to trash himâ€. Reliable sources reveal that the airport hullaballoo is meant to divert the peopleâ€™s attention from Rutoâ€™s well known jet scandal, which apparently Kimemia- the Cabinet Secretary also leaked. Apparently, the jet acquisition was driven by paranoia. Ruto was afraid of using Uhuruâ€™s jet because of what insiders close to him called the â€œGarangâ€/ Saitoti syndrome. He could only trust a European company with his life, not an Uhuru led government owned jet. This is where a government jet mechanic removes an essential component, but whose anomally you realize when the jet is hurtling down from 30,000 feet above the ground. Analysts also wonder how Rutoâ€™s shady deals are coming out in the open while Uhuruâ€™s remain in the background. Is Ruto under a cold war assault? How come all that he does is being leaked by Kimemia? Rutoâ€™s insistence, mainly driven by what psychologists call UhuRuto governmentâ€™s insecurity and low self esteem, is what led to the protocol mishaps that the PM faced. The ICC duo, under psychological pressure, has not only lost confidence in themselves, but have also fast ran out of ideas. Itâ€™s almost 90 days, and yet no single Jubilee pledge has begun to be implemented. The poor are still poor, the sick are still in pain. The jobless are still jobless. KNH the nationâ€™s referral hospital has no medicine and continues to be understaffed. Uhuruto are worried and scared that Kenyans might rise up against them. 2017 isnâ€™t far away. The UhuRuto duo has a pronounced fear of the unknown, and they blame Raila Odinga for their psychological and legal woes. Deep inside, they resent themselves. They thought the presidency would bring happiness, but all they have is misery and disillusionment. UhuRutoâ€™s desire to lead was part of a self-medication effort. Turns out they donâ€™t feel any better. Power doesnâ€™t heal accusations of genocide. It actually consolidates those accusations. Â Ask El-Bashir- another ICC suspect wanted for war crimes in Darfur whose empire is under assault from all sides- actually its collapsing. Uhuru and Ruto were indicted for war-crimes committed in Kenyaâ€™s Rift Valley Province, in which they are accused of financing and/ or turning their tribesmen against each other. What Uhuru and Ruto are doing against Raila is a common coping mechanism exhibited by war criminals the world over. El-Bashir recently shut down down the pipeline connecting S. Sudan oilfields to Khartoum under the pretext that they fund Sudanese rebels. War criminals are known the world over to respond irrationally to easy problems. They prefer to blame others than themselves for the crimes they are accused of. And so Uhuru and Rutoâ€™s preoccupation with some real estate space in an airport is just a coping mechanism that should be ignored. Its part of the wider self medication process, which started with claiming that Raila was behind their ICC woes. For Uhuru and Ruto they should be depressed. Whenever they go abroad, they are being restricted as to which places they can go, and others they canâ€™t. Some leaders only want essential handshakes with no photos. I mean no-one in his right mind wants aibu ndogo ndogo(Swahili for embarrassment), being associated with these dudes. They can meet, not just when people can see them. Ask David Cameron. He was in trouble for talking to Uhuru. They are depressed- and they should be. Thatâ€™s why I recommend a psychologist/psychiatrist in their entourage. They didnâ€™t deserve to be president/ Deputy President, but now that they are, Kenya and the world has to manage the situation, by helping so it doesnâ€™t get worse. Faced by bad publicity locally and abroad, the Uhuruto duo- it seems are latching onto any straws they can get their hands onto. I wonder who they will turn to once they discover Raila is invincible. We all know that Raila has just been relaxing for the most part, with gym workout in between, and on his ipad catching up with various world leaders of his class, which Uhuru/Ruto apparently have realized they canâ€™t even take photos with as principals. Raila has been dignified, non-confrontationalâ€¦ he has failed to swallow any of their bait or play into their handsâ€¦ he has moved on in full defiance of their expectations and gameplan. They want him to be bitter. They are rubble rousing him. Soon they will declare him stateless persona non-grata. Or even detain him. So why are they scared of a harmless Raila? Potency. They know he is potent. They want him to react irrationally, but they arenâ€™t getting that. Like Jesus for those of you who are Christians, the fountain of humility is just â€œturning the other cheekâ€. And Kimemia( Kenyaâ€™s Secretary to the Cabinet) and his groupies are getting desperate and frustrated. My worry now about those airport shakedowns, is that they might plant bombs on Raila, or insert them onto his luggage. Reliable sources say thatâ€™s the bigger plan. They want to brand him a terrorist. Thatâ€™s what they are laying groundwork for. Hopefully that will scare the world about doing business with the â€œMandela of Sub-Saharaâ€- in their figment of imagination. These ICC suspects have a bad past record, and are capable of Satanic deeds. With them as world renowned â€œmurder suspects and ICC inducteesâ€, they are keen on giving Raila a tag like â€œterroristâ€ so they are at parâ€¦ in other words what Kenyans say in Swahili ndio watoshane. Moi tried and failed. Kibaki tried and gave up cutting Raila to size. Uhuru and Ruto will exhaust their political capital even before they begin. With approval ratings of just a paltry 29%, in a few months they will be the most â€œhated coupleâ€ in Kenya. Railaâ€™s favorability ratings presently stand at 66%. And Kenyaâ€™s intelligence agency- NSIS- which is led by an Uhuru tribesman- is darn scared. And honeyÂ bring your ears closer I whisper to you, â€œthe airport drama is in response to those stark numbersâ€.